A visit here was planned on our annual Ireland expedition last year. Eager anticipation and much excitement as we arrived at the gates to find them well and truly shut. It was a Monday – the park is closed Sundays and Mondays. Lesson learned, this year I did my homework and we rocked up on a Wednesday. All was well with the world and we got to go inside – phew – crushing disappointment from Son was not something I wanted to be the cause of again. Lots of cars in the car park but with forty acres to explore it wasn’t remotely crowded. 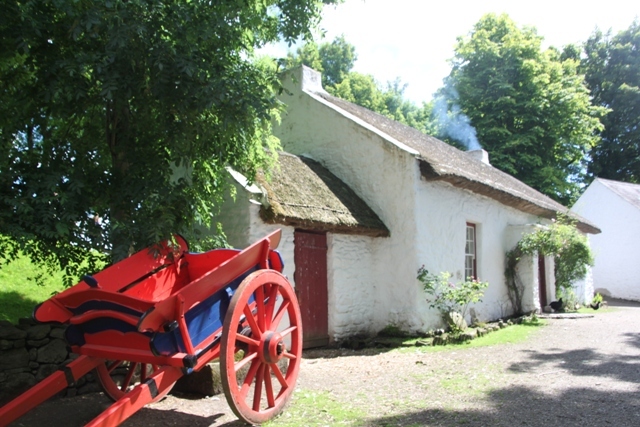 We had the best day out – this truly fantastic open-air museum telling the story of 19th century Irish emigration is a gem. The story of how 3.5 million people (a seriously substantial percentage of the population) left for America between 1820-1880 makes an absorbing tale. 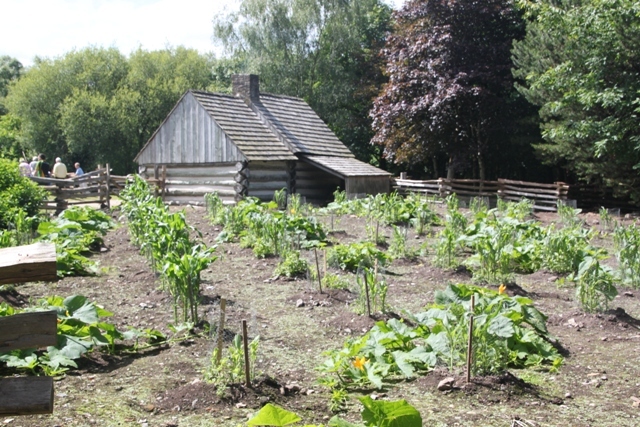 The museum was established in 1976, initially built around the original farm house of Thomas Mellon – a boy whose family emigrated to Pennsylvania. Mellon went on to become a judge and found a banking dynasty after humble beginnings here in County Tyrone. Since then houses and buildings have been added and it has grown year by year. 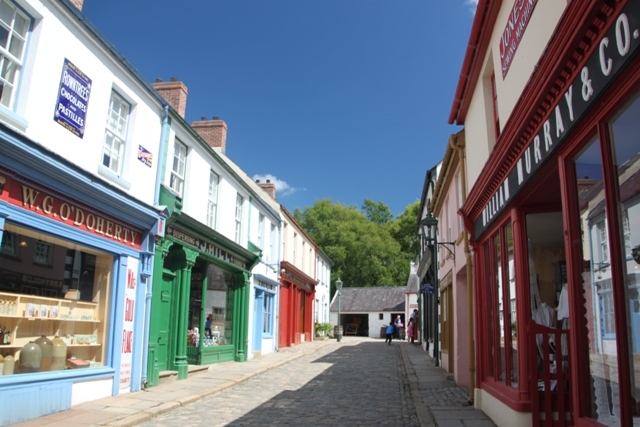 There are authentically thatched cottages, log cabins, original shop fittings and frontages as well as an array of costumed characters going about their daily business. Three generations of our family spent five hours here and reluctantly left at closing time. 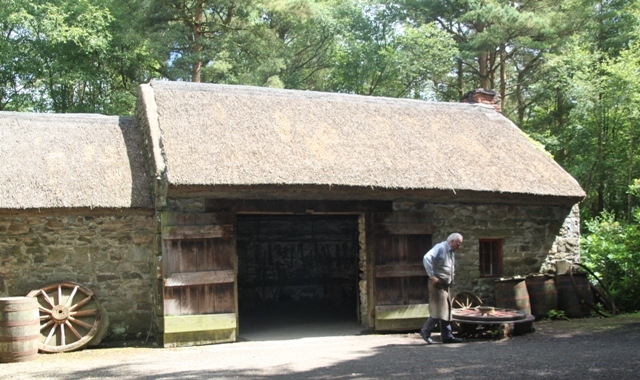 The visit begins and ends at the visitor centre. 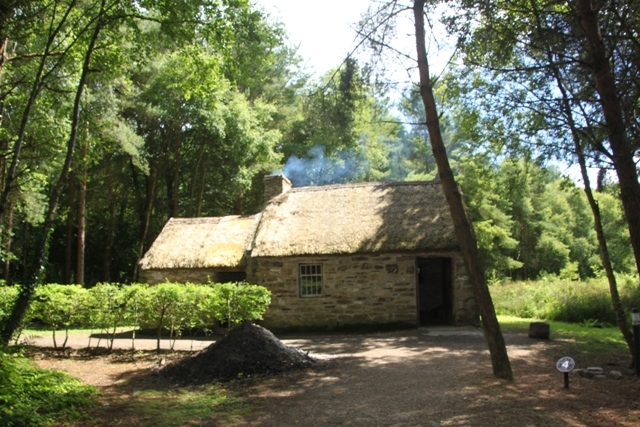 The first part of the park is the Old World – thatched cottages, cobbled streets and traditional Irish lifestyles. We started in the Single Room Cabin, moved stone by stone from the slopes of the Sperrin Mountains nearby and marvelled at how things once were. 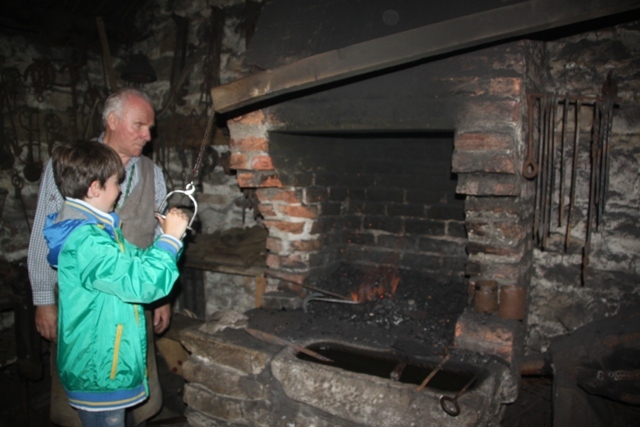 Just a short walk away was the blacksmith’s forge – the friendly blacksmith demonstrated his craft and showed Son how to use the bellows to start the fire. 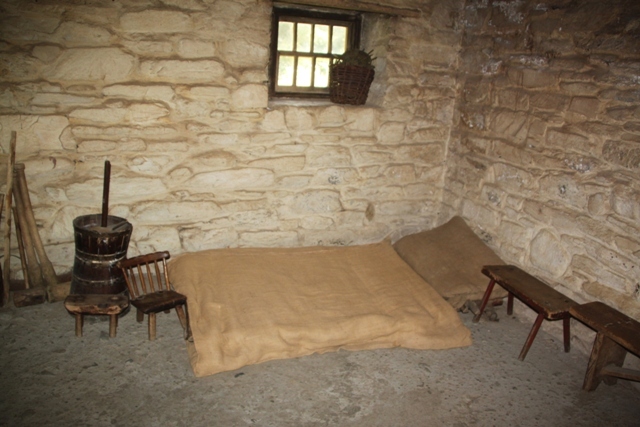 Weavers Cottage was a highlight for me with a family history in the linen trade I found it particularly interesting. A lady demonstrated flax spinning, carding and combing and we saw the loom where tweed and linen were woven. 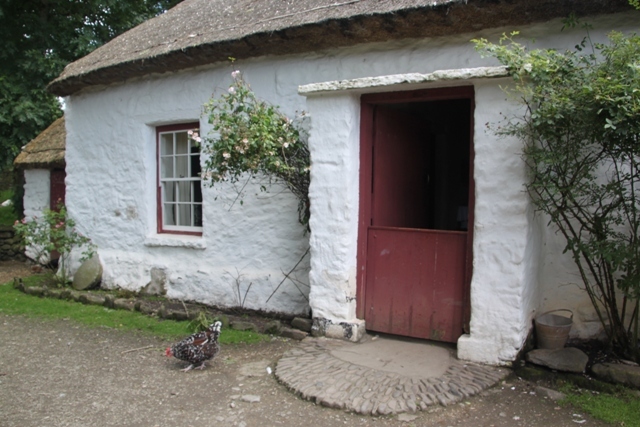 The Mellon homestead is on its original site – lovely old whitewashed buildings, an old farmyard and plenty of chickens pecking around. A stroll down Ulster Street next, the finest collection of original, traditional 19th century shop fronts brought in from local towns and villages. 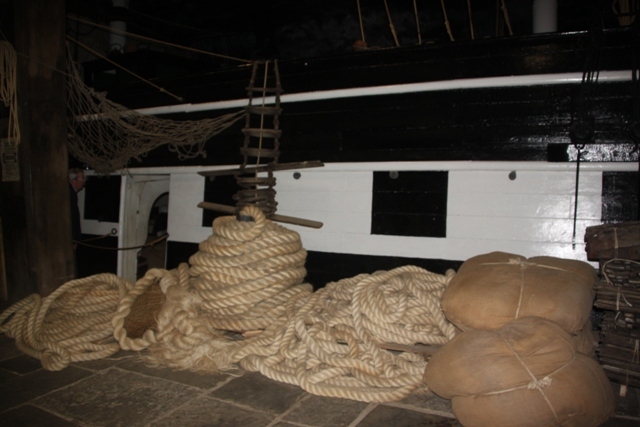 This was a recreation of a typical street the emigrants would have passed down before boarding their ship to the New World. There were shopkeepers in most of them, we found the pub and the post office and Son bought some sweets weighed out on old fashioned scales and poured into a paper bag. The transition from the Old World to the New World was extremely well done. At the end of Ulster Street were some original dockside buildings. 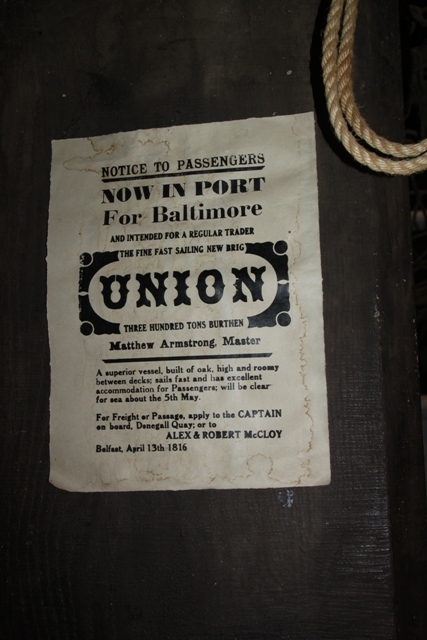 We entered and then boarded a full scale replica of an early 1800’s ship – the Union – and saw the cramped conditions and heard of the hardships people endured on the Atlantic crossing. 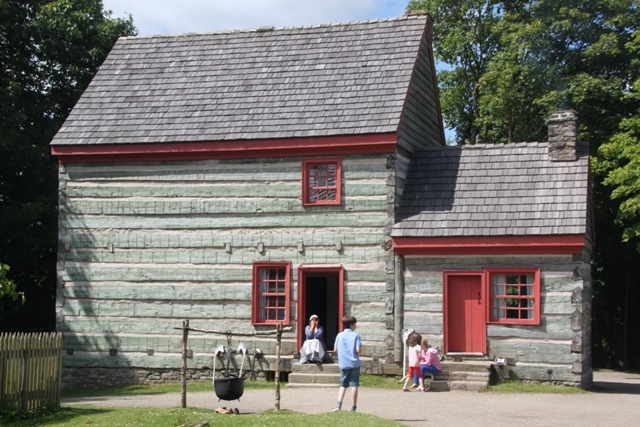 We stepped off the ship and found ourselves in the New World – a typical American street scene that would have greeted emigrants in Baltimore, New York or Boston. 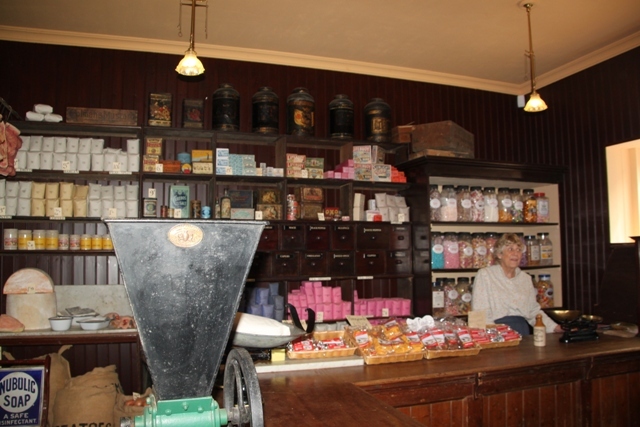 A peek in the General Store where we had a chat with the storekeeper and we stepped inside a replica of the first Mellon bank. 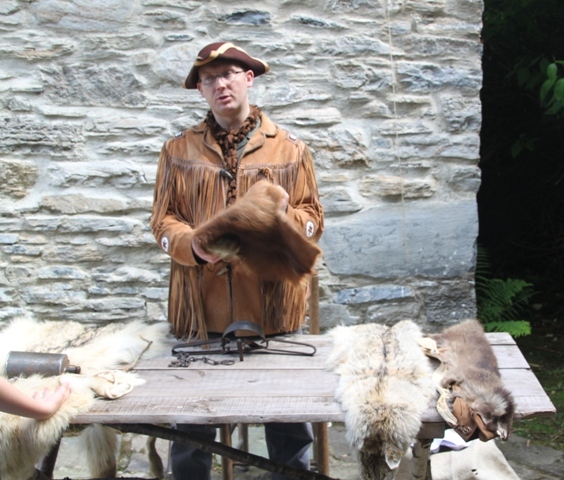 Son found a fur trapper who had a selection of different pelts. We saw the more spacious houses the emigrants built when they had more time and money. 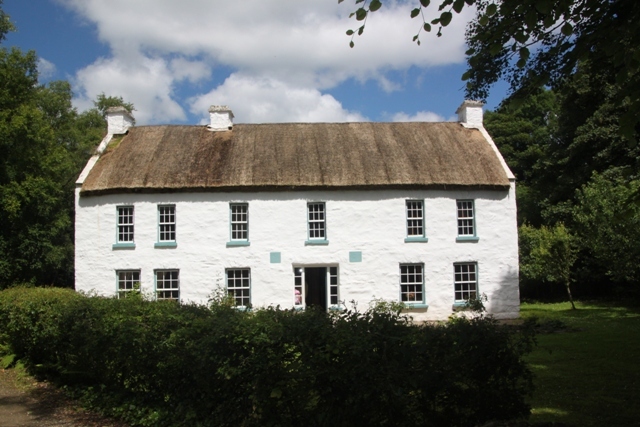 This two storey farmhouse was where the Mellon family lived four years after their arrival. 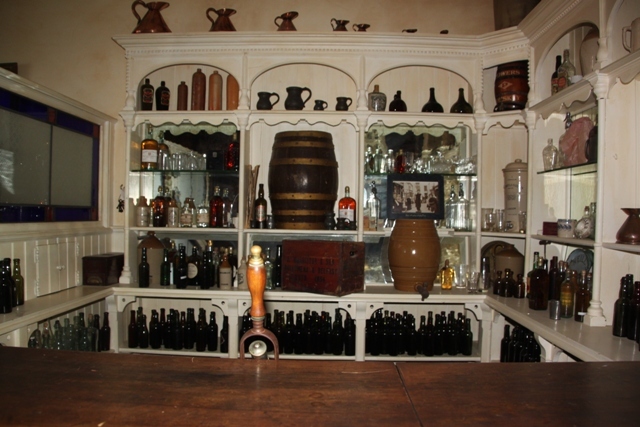 A replica, apparently the original still stands in Export, Pennsylvania. The wooden fences and scenery made us feel transported to the prairies. Son was spell bound by the newest house – a big, grand affair which had a fascinating family story and which turned out to belong to a family with fifty slaves. Back at the gift shop we browsed and after coffee had a look around the Exhibition Gallery. 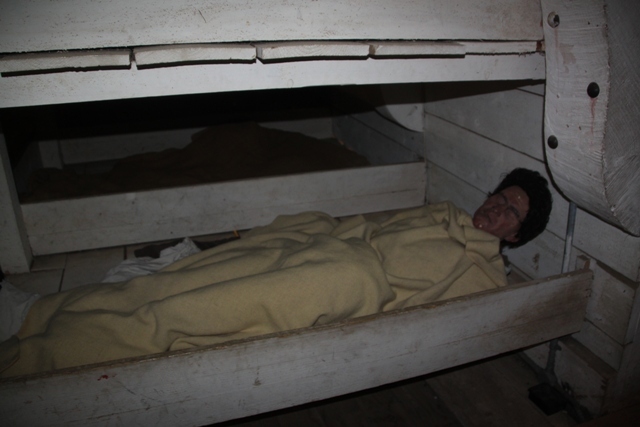 More fascinating things to see – so much to do here – we found an old wagon and a replica of an American boarding house where fifty people slept top to toe underground. We barely had time to look around the Titanic exhibition before it was closing time. An incredible day out, I can’t rave enough about this museum. In times when travelling to the USA involves merely hopping on a plane, it is easy to forget those who once set sail for an alien land and said goodbye to their homeland and all that was familiar forever. This place brings their story alive in such an emotive way, it is a special and wonderful place. That looks great! What a really clever way to do the transition. I confess I have never been to Northern Ireland. We’ve been to a few of these living history type places but I have to say I definitely think this was up there with the best of them. The atmosphere was wonderful and it was great to “board” the ship and alight in the New World – like you say Anabel, so clever. OMG, Joy, this is so amazingly beautiful. I love those villages. It is so cool to really go back in time and feel a time long ago, imagine how people lived and even stand in the original buildings. Thank you so much for sharing. This was a wonderful place, the way the guides interacted with the visitors and told how it was in those days made it such a memorable experience Erika. The pictures truly show a lot what you say!!! Always glad about your posts, Joy! I love historical recreations. They bring history to life so well that it sparks the imagination to feel as if we were there. I hope to get to Northern Ireland one day with this place on my list. 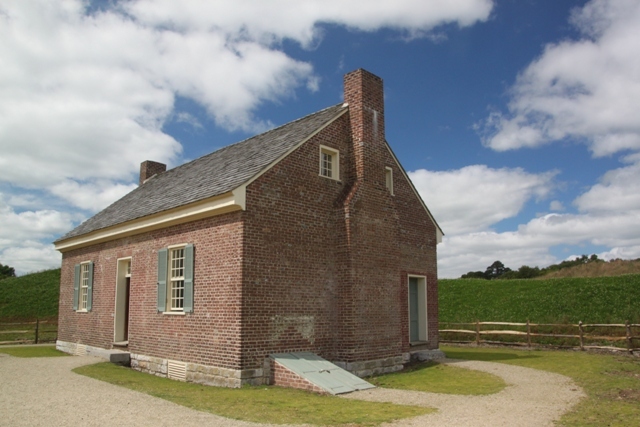 This place was amazing – we loved the whole experience – and like you say history was brought to life so well. You definitely should visit Northern Ireland (I’m biased though) but it is fabulous!! This looks great! 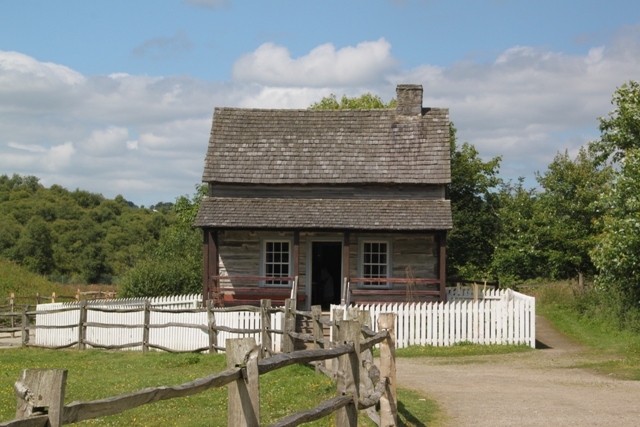 I’ve been very curious about the Ulster American Folk Park, but know I know I’ll have to go there! It’s superb – we loved our day out there. The sun was shining – that always helps! – but it is fascinating and the whole experience of “moving” from the old world to the new is so well done. They have different special events on there too throughout the year – the Bluegrass Festival around September time is supposed to be amazing. Would love to go when something like that’s going on! This looks to be a really well thought out living museum. The transitional bit seems to really underscore the concept of leaving the past and old country behind and embarking on something new and unknown. Even when my Great-Gran emigrated to America in the 1920s (she then went back to Shetland) it was a very different experience to what I am dealing with following in her footsteps so it is almost impossible to imagine what it was like for the immigrants from even earlier periods. My grandparents emigrated to Canada in the early 1930’s (and also came back!!). It was one of the best of these types of museum we have been to, the ship being especially well done. 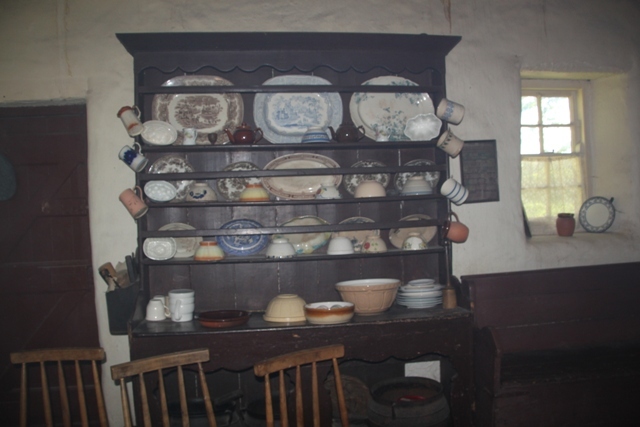 The stories we heard showed how hard their lives had been in Ireland and most of them really seemed to make something better for themselves in the New World so, although hard it was all very inspiring. You find the most interesting and unique aces to visit. Another gem. This place is incredible George. It’s not so far from where I grew up, but it’s taken me this long to visit!! I should have gone sooner! We had a wonderful day out and got a great insight into the lives of some of those who left Ireland for a better life. I love immersive museums like these. I went to Plymouth Platation when I was an early teen and want to go back so bad. Speaking to the docents who play their roles so well is so much fun! Just googled that – it also looks amazing. Definitely one for the “list” – anything with the Mayflower sounds fascinating to me! This place was great too – so much to see and do and like you say, speaking to those who worked there was a lot of fun and we learned a lot too. what a sweet village….makes you feel like life was really nice many years ago….more calm I guess. Yes definitely calmer Diana, no real distractions and they wasted absolutely nothing. We saw how everything was reused and reworked – amazing. Life was much harder though, none of the comforts we take for granted, that was really obvious too. A great day out. Thank you Pam – Ireland is a beautiful place and this was the most wonderful day out! It was a fascinating place Rosemary – I think the whole Irish/American thing is an interesting story and they tell some great tales here. You’re right though, although the cottages looked lovely, life seemed extremely hard. Our pampered son was amazed to see the first cottage where the parents slept on a make-shift mattress with sacking to cover them and the children slept on the floor! Unimaginable nowadays. Good luck with the packing – my worst part of a trip (well unpacking is but this is a close second). Have a safe journey and a wonderful trip, hope it all goes well. I enjoy visiting this kind of open-air museums. There’s one in Dallas depicting life in the area in the 1800s and early 1900s, with original buildings and docents in costume. Definitely a great place to take kids too. They’re really great I agree Ana, it makes history come alive in the best way. We learned so much on this visit but had loads of fun too. Our son completely agreed and got so much out of it too. Interesting! It has a real charm which I find alluring! It makes me think of Bokrijk in Belgium. It was such a fantastic day out – beautiful but also full of history, we loved it. 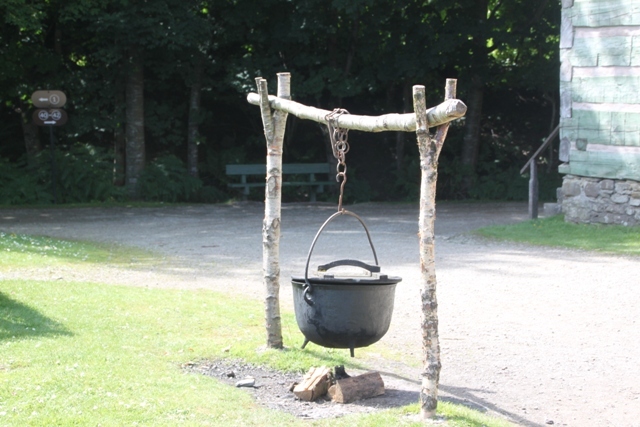 Just googled Bokrijk and it looks like a great day out too – maybe someday…. I’m glad you managed to get in and it wasn’t too crowded, This open air museum looks so fascinating. I haven’t been to an open museum like this since I was a child. All the houses are so quaint and lovely, something I would like to live in now! It was one of the best museums of this type that I’ve been to – really scenic but fascinating and educational all at the same time. It was fantastic here – so interesting to relive the history of all those Irish people who left the island and went to America. There are plenty of sheep and a lot of green (and much whisky) but if you ever get to Ireland this is a super day out.